I like imagining there are people always debating which Elizabeth Bishop book is best. People I know always point to Geograhpy III, and they say, “GEOGRAPHY III!” And it makes me look at those poems again. And I’ll like them again. But I won’t love them like I love North & South. Those abstraction-world constructions like “The Monument” and “The Fish,” that push me into the world prismed by idea and real and being, like active being stretched taut so I can see its passiveness fitting with other passivenesses. Oh, world! I am thinking in this world, and being in this world. And part of my being is required to be thinking, which is exactly what I feel like my being normally is anyway. But now it’s a poem! Welcome, Eric Ekstrand to the world of my thinking of being a thinking being! Which is a whole-hearted way of me saying, “Welcome Laodicea to the world of extravagant abstractions poetry.” But don’t think “abstractions” as “lyrical, inconcrete world.” It is one of the onerousnesses of lyric, as category, to see it in some “lyric vs. narrative” binary. Like the poetry world was stuck in 1995 and “lyric” was code word for “abstract,” “opaque,” “difficult” work. Yes, lyric can mean inconcrete, lyric worlds, and I would hope any truly contemporary reader could see the fine and fun in that type of work. 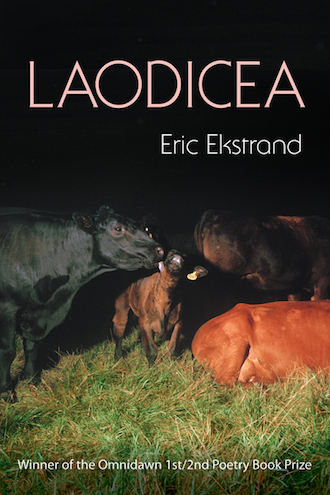 And knowing of Ekstrand’s other poems before Laodicea, those worlds easily a place that his first book could have spent great deals of time. But Ekstrand is proposing to abstract the most Poetic and Meaningful locales: The meadow. The Nemesis. Friendship. Winston-Salem. I love Winston-Salem! The department chair’s office, or at least the decoration choices of a department chair. Which, for whatever reason, seems to inevitably trend toward wood paneling. Ekstrand proposes his Nemesis as animal, but not any one specific animal, more the animal concept parts that “you” want to assign nemesis. Think of Robert Gober sculptures where human body parts exist in unusually flat, often awkward and strangely too-familiar positions. Now think of what would happen if Gober made direct correlations between those sculptures and some abstract idea like Domestic or Repair. Maybe this isn’t exactly the relationship between nemesis and concept-animal, but the tonal situating of image, and its relationship with subject or occasion are what I’m looking for. This is Nemesis as not just enemy but nemesis as familiar and in mind and aware. And this only in the scope of a single poem, among an entire book full of poems that are actively abstracting. The question would then arise, “Is there one Abstraction at work accumulating subsidiary abstractions?” One Abstraction to rule them all, perhaps? Yes, there is! The Abstraction of “the land.” Is the land a nemesis? Is there some antagonism implicit to the land that the speaker is having to contend with? I would say these are useful questions for Ekstrand’s book, and they span the full length of it. How might an antagonism operate within the love the speaker feels towards his friends, Hannah and Sean? Are they a part of this land? Ekstrand writes a full section of poems about North Carolinian Harold Hayes. How should a reader understand the relationship Hayes had with the North Carolina where he was living? What significance is it that it’s the same North Carolina where Ekstrand is living? Is the relationship antagonistic? Observation? Evacuated nostalgia? I look to the book’s title, Laodicea. Alluded to in the book’s title poem, the Book of Revelations depicts Laodicea as a place whose waters are neither hot nor cold, but lukewarm. And from that state of lukewarm, Jesus, as he appears to John, says he will spit the church of Laodiciea out of his mouth. Such a curious gesture against what seems, at worst, simple mediocrity. Consider, however, that lukewarm can cause one kind of complication if it’s being attached to love or attraction. It proves an entirely different complication when assigned to antagonism. At its most poignant, this complication plays out in the poem, “Laodicea” with the interplay between its two epigraphs. One epigraph features the Book of Revelations. The second epigraph quotes two lines from Walt Whitman’s poem, “The Wound Dresser.” Whitman’s lines express explicit homosexual affection (“Many a soldier’s kiss dwells on these bearded lips”). At issue is why these two lines were omitted from an inscription above the Dupont Metro Station in Washington, DC. Though the speaker here isn’t really asking “Why?” but rather explaining how the omission leaves him as a citizen of the Land pushed away from really belonging to the Land. Ekstrand flattens the Land into the language he imagines it would prefer. Leaves whose signifier leans toward a “republican hunter green.” A golden dog not allowed to frolic among the rhododendron, only to pose within an abstracted view of them. It’s like the land has been so crowded by words and signifiers that any perspective on the land requires, first, a consideration of the land via language. That dog in the “muscle // of the word rhododendron” is especially dense in putting the signifier in the dominant position to reality. What is supposed to make sense when the Land is apparently so subsidiary to its signifying language? And why, then, has this land, in the place where it expresses itself, chosen to omit Whitman’s loving words, especially when Dupont Circle is well known as a gay neighborhood? What underlies all this lukewarm resistance to the land is the paradox of living your life comfortably even as you feel the land doesn’t fully accept you. Ekstrand might concede to “occasionally” enjoying the lavish treatment proffered at a local bar, but the occasion is assuredly undercut by a degree of frustration. It makes for a nemesis that could be mistaken for or overlooked as trivial. One of those micro-aggressions Claudia Rankine tells of in her book, Citizen. However, within any slight from the Land, even the trivial slight, lies what may or may not be an intractable, unmistakable and dismal resistance to something you are afraid could be you. That Ekstrand’s book can identify this kind of anxiety while not absolutely insisting on resolving it is the larger accomplishment at play in Laodicea.